The delivery times may vary, see cgv contact us before the purchase. By clicking on immediate purchase, the customer certifies having read and accepted the general conditions of sale! Available at the bottom of this page. 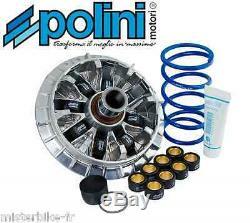 Brand: polini; range: hi speed; 8 pebbles. New generation of polini variator studied and designed for the t-max 530 since 2012! Your racing soul could not wait anymore. With the arrival of the new generation t-max, polini wasted no time. The new hi-speed evolution drive is a true masterpiece of technology: its main feature is the extraordinary patented lubrication system that delivers exceptional performance and performance without sacrificing maximum reliability. You will immediately know that the stopped starts are more burning and, thanks to the new rotation speed, you will improve the acceleration to reach the maximum speed sooner. Technical characteristics: thrust spring with load increased by 100%. Buckle in nickel-plated chrome steel, tempered and ground. It stands out for its high-capacity inner housing which functions as a reservoir of grease, inside of which there is a special spring that allows a constant distribution of grease on the barrel, even under the most difficult conditions. The interior of the roller tracks has been specially treated to improve sliding. The pebbles are covered by a new mix of nylon material and aramid fibers. The packaging contains 2 sets of pebbles, one of 16 grams and the other of 18. Choose your driving: pebbles of 18 grams for a ride driving pebbles of 16 grams for a sport driving for a driving average between sport and touring can be mounted 4 pebbles 16 grams and 4 of 18 grams. This article is assembled on 11 vehicles. Xp 530 t-max 4t lc. Xp 530 t-max abs 4t lc. Xp 530 t max max iron abs 4t l. Xp 530 t-max max lux abs 4t lc. Choose the delivery method before paying. The processing time of your order can vary 7 to 15 working days, contact us before the purchase !! other thousands of pieces with misterbike-fr. Anti-theft, batteries, spark plugs, chain kits, pinions, crowns, chains, clutch discs, air filters,, oil filters, fuel filters, oils, engine gaskets, spinnaker gaskets, brake levers and clutch grips, grip pads, jaws brake, fixed and floating brake discs, brake pads, motorcycle tires, cross and enduro tires, scooter tires, quad tires, inner tubes, lamps and spotlights, wheel bearings and steering bearings, spraychain, turn signals, mirrors, fork tubes, cables, tank caps, handlebars, saddles, bolts, handlebars, valves and stoppers, contactors, workshop saddles, footrests, belts, exhausts, tools, top cases and windshields. The item "polini hi speed 8g yamaha t-max / tmax 530 2012 241.700" is on sale since Tuesday, May 24, 2016. It is in the category "auto, motorcycle parts, accessories \ motorcycle parts \ other".